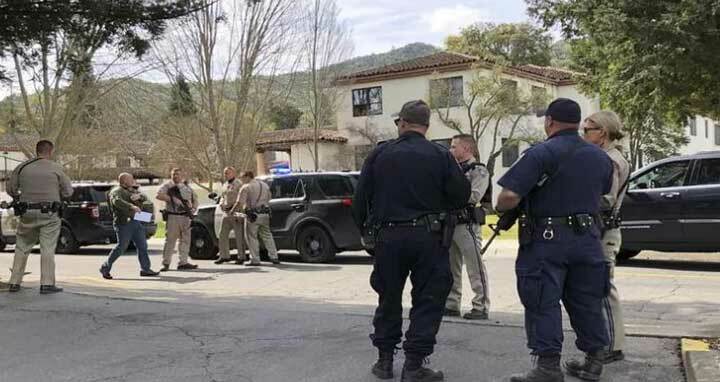 Dhaka, 10 Mar, Abnews: A former client at the Veterans Home of California and three women he held hostage during an apparent hourslong standoff on Friday have been found dead, authorities said. Hostage negotiators spent hours trying to contact the gunman at the facility in Yountville until shortly before 6 p.m. they found him and three women dead, said Chris Childs, assistant chief of the California Highway Patrol's Golden Gate Division. The suspect was identified as 36-year-old Albert Wong of Sacramento, the Napa County Sheriff-Coroner's Office said. Wong was a client of The Pathway Home, a counseling program for veterans who suffer post-traumatic stress disorder (PTSD), which is on the property. He left the program two weeks ago, according to State Senator Bill Dodd. The victims were identified by the coroner's office as Christine Loeber, 48; Jennifer Golick, 42; and Jennifer Gonzales, 29. Loeber was the executive director of The Pathway Home and Golick worked there as a staff psychologist. Gonzales was a clinical psychologist with the San Francisco Department of Veterans Affairs Healthcare System. "These brave women were accomplished professionals who dedicated their careers to serving our nation's veterans, working closely with those in the greatest need of attention after deployments in Iraq and Afghanistan," a spokesperson with The Pathway Home said in a statement. It's unclear if the women were chosen at random or had a connection with the gunman. Investigators are working to determine when during the standoff the deaths occurred. he Yountville facility is the largest veterans' home in the country, according to the California Department of Veterans. California Governor Jerry Brown said the shooting "tragically took the lives of three people dedicated to serving our veterans." "Our hearts go out to their families and loved ones and the entire community of Yountville," Brown said in a statement.